Though smaller than in years past, this week’s CeBIT trade show in Hanover, Germany remains one of the giants of the industry and is a must-attend event for much of Europe’s technology leaders. For the last two years, I have been participating in Webciety, a show within the show that explores the emerging 21st century digital lifestyle. Webciety has a focus on both consumer and enterprise applications of Web 2.0 technologies as well as closely related trends such as cloud computing. Given its access to a wide cross section of attendees, it’s also a good crucible for gauging the latest trends, albeit in a largely tech-savvy audience. At the moment the use of consumer social Web tools is as big here in Europe as it is in the United States, even it doesn’t always involve Facebook or Twitter, though those social networking services are widely used too. Social sites that are popular here at the moment include what is often referred to as Germany’s Facebook, studiVZ and Europe’s version of LinkedIn, XING. What is slightly more of a hurdle in Europe, but is nevertheless making inroads, is the rising use of social tools in the workplace. Business leaders here — and make no mistake, in the United States as well — still want to be convinced that enterprise social software is good way to improve communication and collaboration for their organizations. Although the wide adoption of social tools in private life globally is starting to underscore the urgency for many decision makers, much of the discussion here this week in Hall 6 on the gigantic CeBIT fairgrounds is over the specific issues and concerns of the business adoption and ROI of social tools. Related: What will power next-generation enterprises? As the eponymous title suggests, Webciety itself is a fascinating experiment in bringing both topical and bleeding edge topics in culture, society, and technology to the often-staid and buttoned down European IT industry. The content itself is organized by Kongress Media’s Bjoern Negelmann (who in the mode of full disclosure is my host here at the event this week) and is a well-known figure in the Enterprise 2.0 space in Europe. The result this week has been, by most accounts, an intriguing and successful mix of consumer and enterprise perspectives on today’s increasingly Web-driven society. The last few days of panel discussions amongst practitioners, vendors, and customers has captured a snapshot of where businesses here are in terms of their mindset and overall readiness to begin adopting social and cloud technologies largely coming from the Web. Many organizations I talk to here seem to clearly be somewhere in the adoption phase, either just starting or trying to understand how to improve the early results of their efforts. Thus — as is the culture here — interested skepticism is the norm. Yet, it’s also evident in my discussions with attendees that many organizations are currently having to deal broadly with newly arrived and often competing social technologies at the departmental, division, and enterprise-wide level. Like it is in the rest of the world, the Social Web seems to be moving inexorably into today’s European workplace. How companies respond will likely define the possibilities in terms of how well their employees will be able to communicate and work together with the rest of the world. IT organizations in Europe are generally regarded as more organized and disciplined in their use of information technology. They’ve classically been large-scale adopters of highly structured IT solutions including enterprise content management (ECM), document management (DMS), knowledge management (KM), enterprise portals, unified communications (UC), customer relationship management (CRM), ERP, HCM and the whole alphabet soup that makes up today’s in-house IT systems, 3rd party products, and associated enterprise architectures. 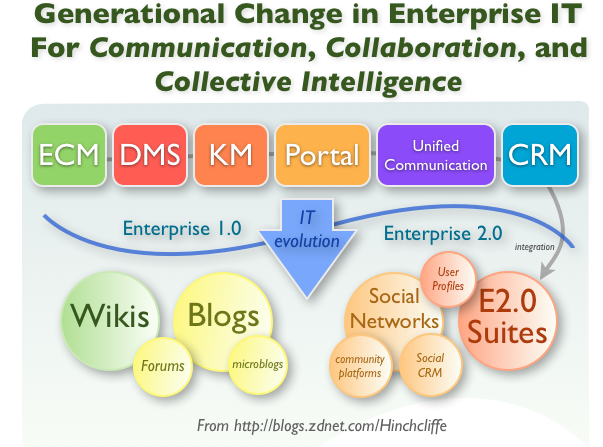 However, as modern IT moves into the 2.0 era, many of these very entrenched technologies, which typically have major constituencies as well as higher levels of use than in the United States, are feeling the pressure of Enterprise 2.0 encroachment, which compete with and augment — though usually not replace outright — many of these enterprise platforms. As IT starts to find itself in the middle of a new business environment that consists of more open, social, and freeform IT solutions, it is this overlap in particular that’s becoming ground zero for the discussions of how to better adopt these social computing, which even the more skeptical will grant as being much better at maximizing human (and therefore worker and partner) engagement. To determine ROI or not?